So, is it possible, do you think MY cat is a Bengal cat? Home » So, do you think MY cat is a Bengal? Tabby cats and Bengal cats can often look very similar. Without a bill of sale, some sort of registration/pedigree papers from the breeder, or more information from whoever surrendered the cat in the first place, there’s really no way to guarantee the type breed the cat may be. Photos and descriptions just aren’t enough. 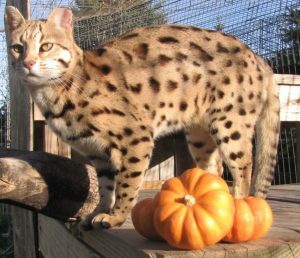 After many generations of breeding, Bengals can now be found in many coat colors. They can be silver, brown, black (melasnistic), snow, red, cinnamon, smoke, blue, or torbie. They can have either spots, rosettes or a marbled pattern to their coat. The spots and marbling is randomly distributed, with no set patterns. That means the pattern on each side of the cat is very different. Bengals and domestic tabbies both have spotted bellies. But Bengals have no white on their body, other than possibly in their chin or whisker pad area or on their belly. A Bengal cat’s fur is very soft and short. It feels much like a rabbit’s, like polished fur. The individual strands of fur are “ticked,” meaning there are bands of 2-3 colors on each strand. They’re also known for their glitter appearance; i.e. their fur sparkles in sunlight. Since the tips of their hair strands have less pigment, light shining through this translucent part of the hair is what makes it appear to sparkle. Do other cat breeds show these characteristics, too? But even if your cat shows all of the above, there are other domestic breeds that exhibit these traits, too. A cat may have spots or marbled fur, but that doesn’t necessarily make it a Bengal cat. Regular tabby cats can have these characteristics, too. 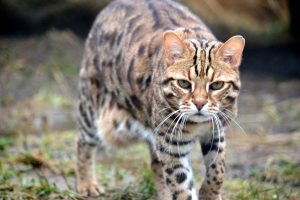 There are also many spotted domestic cats that show these – Ocicats, Egyptian Maus, and brown spotted Manx to name just a few. 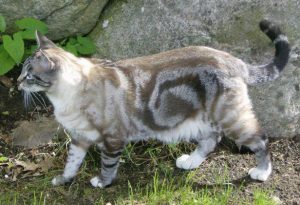 And quite a few marbled breeds like the marbled Manx cats, the marbled British Shorthairs, and marbled Oriental and Asian tabbies. 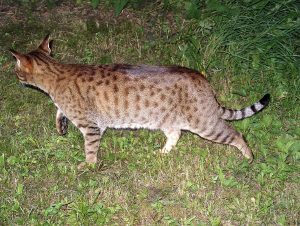 That’s why pictures can’t really be relied on to identify a Bengal cat. Personality traits are also extremely important to look at. With their wild cat tendencies, Bengals are usually much more active and talkative than your typical domestic house cat. They’re extremely muscular, athletic and agile. In the wild, Asian Leopard Cats are amazing jumpers. They climb and perch high in treetops. They swim in jungle marshes. 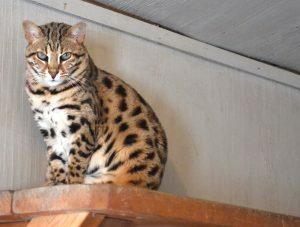 That’s why it’s not unusual to find a Bengal cat sitting as high as they can in a room, on a door frame, on top of cabinets or refrigerators, since they love heights and vertical spaces. Water is a favorite for Bengals. Whether it’s pouring from the faucet or in a tub or shower or small pool, like their ancestors, they love being in or playing in water. They also tend to use water as their own personal “litter box” area, too. Their high energy level means they need challenging interactive playtime as a way to burn energy daily. If not, they can become destructive. They’re muscular and can quickly outsmart a cat-proof fence, even opening doors and windows. Bengals generally don’t like to be confined, especially to one room or area. They don’t do well in shelter situations since they’re typically confined to small cages. This is why they’re so quickly labeled “unadoptable” and euthanized at so many shelters. 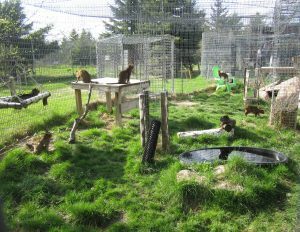 At The Wildcat Sanctuary, the bengals we rescue are provided safe roofed habitats with indoor bungalows and plenty of space, natural amenities, toys, and playmates! Bengals are known for being very loud and talkative. The range of noises they make is much more than the typical domestic cat. Their vocalizations vary from yowls to screams to grunts. They’re difficult to ignore! Bengals generally have long bodies, longer tails than domestic cats, and their back legs are slightly longer than their front legs. This makes their hips stand higher in the back compared to their shoulders in the front. They tend to move more like a leopard, with their head out front in search of prey. Their heads are smaller in comparison to their bodies. Their ears are typically more rounded than a domestic cats’ ears. They share many common traits shown in tabby cats, too. They have a distinctive “M” on their foreheads. Their ears have a thumbprint, an area where their fur is short, shaped like a thumb. Their eyes appear to be a bit more rounded than a typical domestic cat’s almond-shaped eyes. So, bottom line, is my cat a Bengal? As you can see, it’s not an easy answer and never a guarantee. The bottom line is, you share your home with one of the most amazing creatures – a cat. Whether domestic, a mix, or a Bengal, we’re thankful you love and care for your special little one. Find out why we do not support the buying or breeding of hybrid cats HERE. We encourage everyone to rescue a cat in need.